The Tale of the Twisted Claw is a modern re-telling of W.W. Jacobs’ 1902 classic cautionary short story, The Monkey’s Paw. Here Devil’s Night pranksters Kevin and Dougie play a trick on reputed neighborhood witch, Miss Clove. 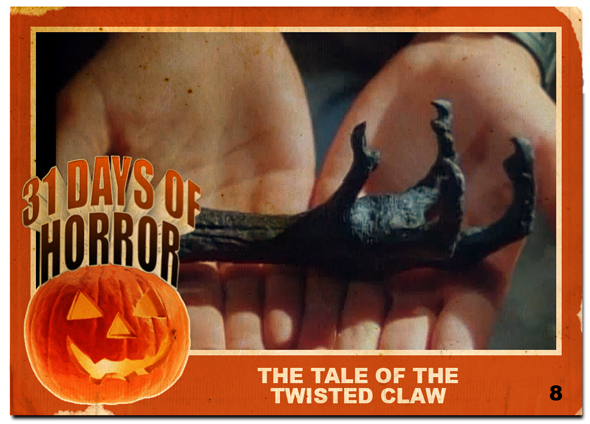 The next night the boys dare to trick-or-treat at her house only to be given a very special treat; a strange vulture’s claw carved from wood. Miss Clove tells the boys that the claw will grant them each three wishes. However, Kevin and Dougie soon find out that the wishes come at a price.